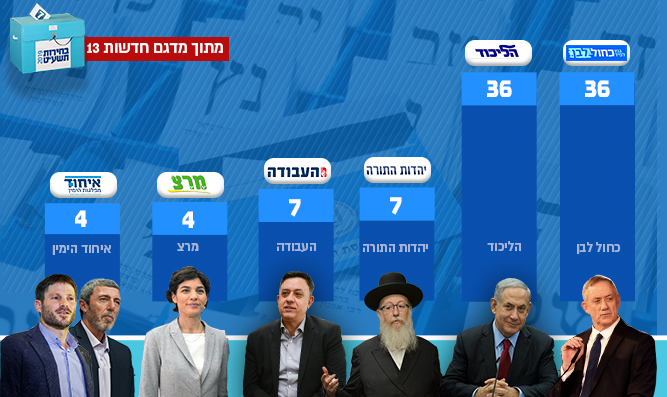 Channel 13 exit poll shows Likud tied with Blue and White, News 12 poll shows Blue and White with 4-seat lead. An exit poll published by Channel 13 News showed the Likud and Blue and White parties tied at 36 seats while the right-wing bloc won 66 seats in total. According to the poll, the Labor, Shas, Hadash-Ta'al and United Torah Judaism parties would each receive seven Knesset seats, while the United Right, New Right, Kulanu, Meretz, and Yisrael Beiteinu parties would receive four seats each. The United Arab List-Balad, Gesher, and Moshe Feiglin's Zehut party failed to clear the electoral threshold, the poll found. The poll was conducted by Professor Camille Fox. The Channel 13 poll greatly differed from another exit poll conducted by News 12. According to the News 12 poll, the Blue and White party won the greatest number of seats with 37. The Likud party finished second with 33 seats. United Torah Judaism won seven seats, Labor six, Hadash-Taal six, United Arab List-Balad six, Yisrael Beiteinu five, United Right five, Meretz five, and Kulanu won six seats, according to the poll. The Zehut, Gesher, and New Right parties failed to clear the electoral threshold, the News 12 poll found. Both Prime Minister Netanyahu and Blue and White leader Benny Gantz have claimed victory in the election.